I love cooking with fresh herbs. It's amazing the difference in flavor between fresh herbs and dried ones. One thing I don't like, though, is how often the herbs I buy at the grocery store get brown and yucky on me before I get a chance to use them. Cilantro is one of the worst. 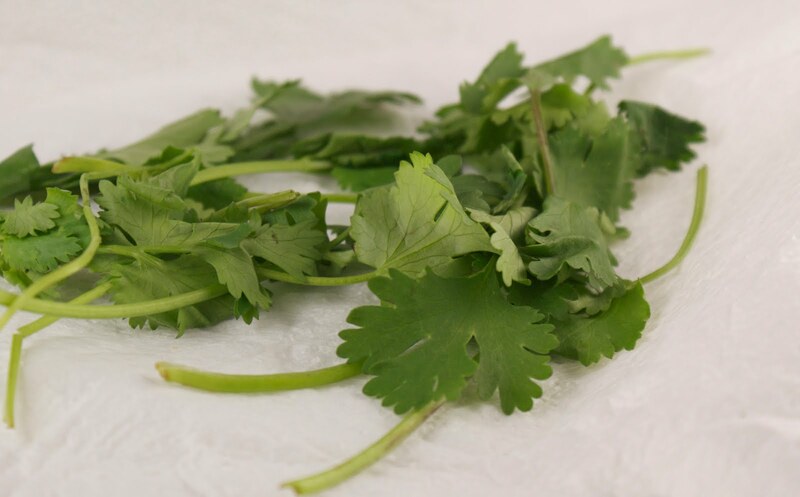 I usually grocery shop on Saturdays, and I know if I want to cook something with cilantro in it I'd better fit it in the schedule before Wednesday or there's no knowing if I'll actually have fresh green cilantro leaves by then or instead have slimy green/brownish ones. 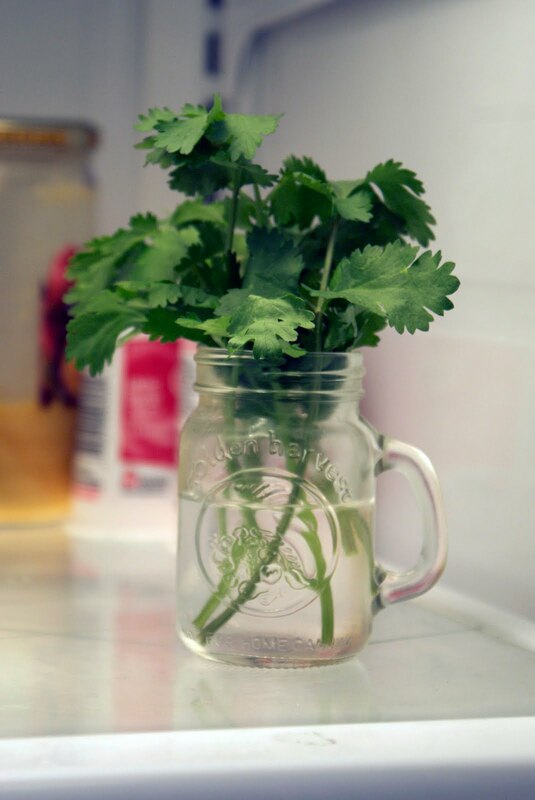 I decided there had to be some way to keep cilantro fresh a little longer, so, being the good scientist that I am, I did a little experiment. I tried three different ways of keeping cilantro in the fridge. 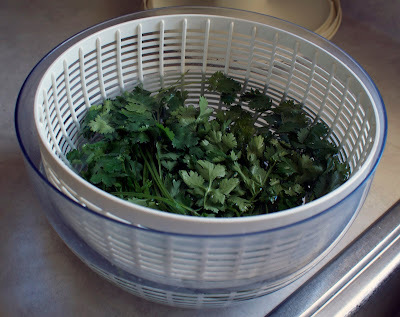 All three methods started out with washing the whole bunch of cilantro in a salad spinner and spinning them dry. One set of leaves I cut about a 1/2 inch off the ends and put them in a jar of water. I covered the leaves loosely with a plastic bag and stuck the whole thing in the fridge. The second batch I laid out on paper towels and loosely rolled up into a cylinder. I put that whole roll in a plastic bag and stuck in a drawer in the fridge. The third set I just threw into a plastic bag in the fridge like I usually do. After a week, here's what we had. The cilantro in the jar of water still looked great, with no signs of rotting leaves and fresh, stiff stems and leaves. 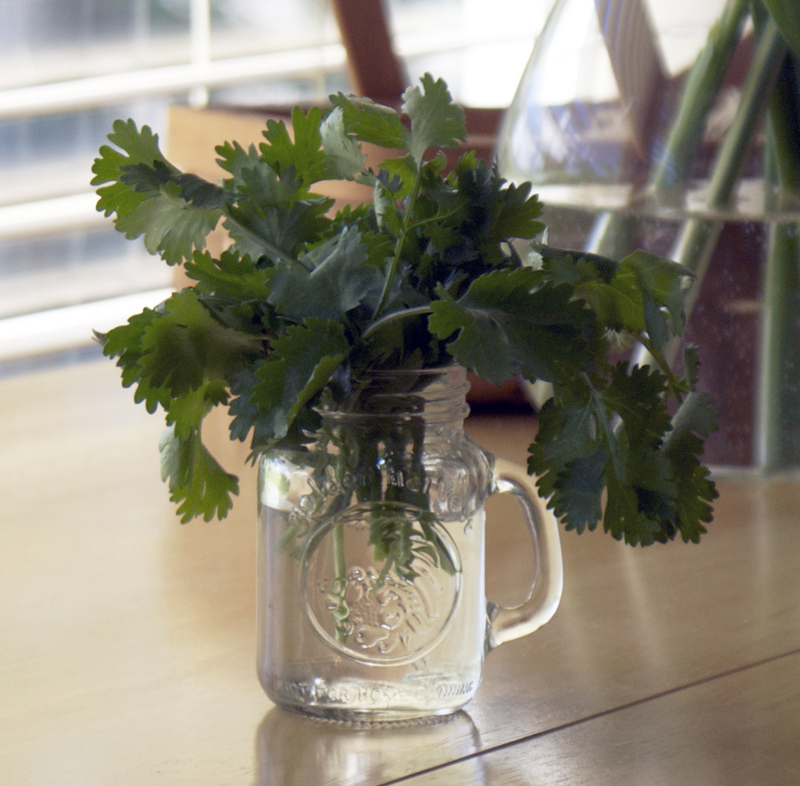 The cilantro in paper towels wasn't rotting, but the stems and leaves were getting wilted. The cilantro in a plain plastic had about a third of its leaves getting brown and slimy. I didn't take a picture because at that point I just toss the whole bag in the trash as fast as possible and try not to dwell on how gross it looks. The winner, I'd say, is the cilantro in the jar in the fridge. It was convenient there, too. I could just pull a few stems out when I needed a bit of garnish or a little something for a recipe. Plus, it is so happy looking in the fridge. Like a little bouquet to spruce up the shelves. Definitely better than brown, slimy cilantro that didn't last a week.